Whether used as a simple centerpiece, arc or festive balloon ceiling, balloons are the quintessential touch to any party. Design Team Member Savannah O’Gwynn, puts her fun and creative spin on decorating with balloons. Using several shades of Divine Twine, she crafts lovely tassels then strings them to the base of each balloon giving white balloons a fresh and airy look perfect for her outdoor party. Simply change the balloon or twine colors to suit the mood or theme for your party! For a how-to link for making these tassels and to see other creations by Savannah, check out her blog at savannahland2.blogspot.com. Hi friends! Today, I have a fun project from design team member Savannah O’Gwynn to share with you. Savannah made this super cute bracelet using Solid Divine Twine. This is a great way to jazz up any plain bracelet that you have in your collection. Also, since this bracelet is achieved by tying knots of Divine Twine to the bracelet, you can have your kids do it. There’s no hot glue or chemicals needed. You can create different designs and if you mess up, you can just unwrap it and start over. For more of photos and info of this project, check out her post HERE. Cindi, one of the talented owners of Savvy Stamps, creates some of the most clever and well designed projects to showcase Savvy’s stamps. She also loves using Divine Twine in her creations. Take a look at few of her projects. Clever, right? To see Savvy Stamps line of rubber stamps, click HERE. Make sure to check out all 8 pages! We just stocked the shop with quite a few Divine Twine kNots. Almost every color is available at the moment! What are kNots you ask? kNots are spools of our bakers twine that did not quite make the cut in terms of presentation or size. Are they perfect? Well, no. They may be scuffed or wound a wonky or be on the small size, but there is still plenty of high quality bakers twine on each spools. They are priced at $10 each (a 33% savings) and they sell out fast so hurry on over to the shop of you’re interested. Kari Guilbault posted a card on our Facebook wall featuring a cool technique. She covered a panel of paper with Divine Twine and stamped it with a Papertrey Ink bee stamp. How clever is she to use Lemon and Black Licorice Divine Twine to make the background for the bee!? You can see more of Kari’s work on her Cards By Kari Facebook page. 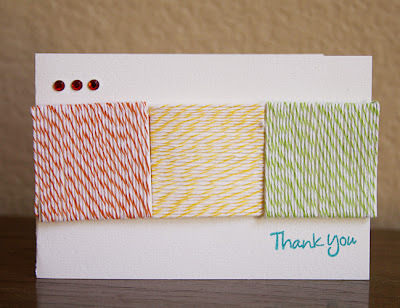 Ashley Harris from The Scrap Review used a similar technique to make this fresh and modern thank you card below. Great minds think alike! If you’ve created something wonderful with any products from the shop, please feel free to share on Whisker Graphic’s Facebook page. We just stocked the shop with quite a few Divine Twine kNots (especially in Brown Sugar). What are kNots you ask? kNots are spools of our bakers twine that did not quite make the cut in terms of presentation or size. Are they perfect? Well, no. They may be scuffed or wound a wonky or be on the small size, but there is still plenty of high quality bakers twine on each spools (at least 200 yards). They are priced at $10 each (a 33% savings) and they sell out fast so hurry on over to the shop of you’re interested. Click HERE to see what we have in stock. Jan Ely has struck again and Oh My! she has blown me away with her creativity. Check out these cupcakes she made using Divine Twine as her inspiration. She covered a styrofoam ball with Cotton Candy Divine Twine and topped it with silver bugle beads and a wooden cherry. This one she made from Orange Divine Twine and topped with orange paper circles (from a hole punch), white glitter and a sparkly orange sphere from her craft stash. Green Apple Divine Twine wrapped and glued around a styrofoam ball and topped with brown paper circles and a “candle” made from a wooden dowel. I love how she used one strand from the twine to make the wick. So clever! She even made a cupcake stand from thrift store finds: A clear glass candlestick, a small white dish and a clear glass tumbler with a glass knob glued on top. You are currently browsing entries tagged with bakery twine at Whisker Graphics.